All products never required cleaning or painting. You can be assured of never having to clean, prep, or paint your pipes, vents, or other flashings. No UV deterioration or rust ever again! Due to proprietary formulation of products, they will withstand hail, freeze, thaw and extreme heat. Products are backed by a 25 year product warranty. 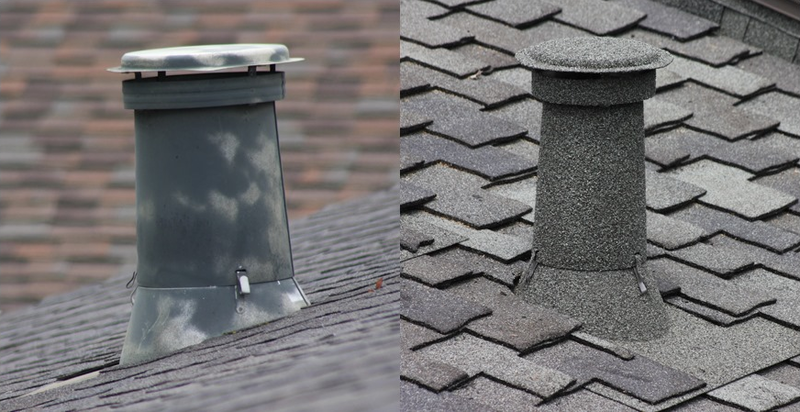 Products make all those unsightly vents and flashings completely blend in and additionally complement any roof or color. Products are universal for all standard types of installations making them extremely fast and easy to install, with no special tools or equipment required. Because products are so easy to install, you will save time from spray painting, which means you will spend less money finishing your jobs. Flashings are sealed water tight at the seam. Various manufacturer’s flashings leak that the seam of the cone leaks and spray paint cannot seal it. Products are reasonably priced so that you can easily include them on every roof, giving the customer that final look of distinction..
Products on all of your roofs will give you a competitive edge over the rest of the competition while making it your personal signature of quality. Does your flashing look like the ones below? Stone Coating can bring you that final touch of quality that brings unity and elegance to your roof. See our before & after gallery below.